Beautifully display flowers and plants with the Sorbus Planter Basket Set. 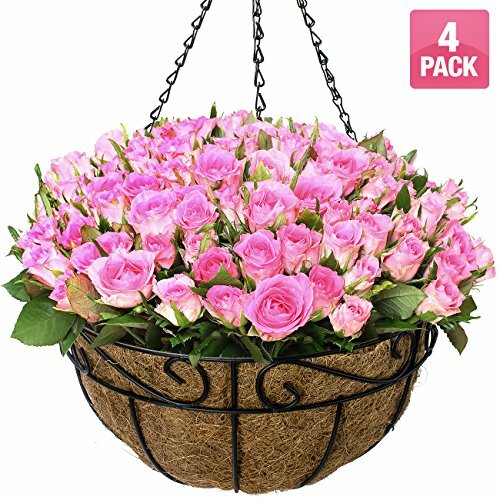 With a traditional look, this plant hanging basket set highlights your favorite plants and flowers with simplistic beauty. Each basket features a circular frame, coconut husk fiber liner, hanging chains, and a secure S-hook for hanging. Home and garden lovers will enjoy quick and easy planting with a few easy steps. To plant, simply place a liner in the hanging basket, add fertilizer or compost, then insert your plants. The coco fiber insert provides superior drainage while promoting healthy plant development. Both lovely and low maintenance, this garden essential is sure to accent your patio, lawn, or garden. Decorate your home, garden, or patio within minutes. Whether you're decorating a suburban backyard, country farmhouse, or high-rise terrace, these eye-catching planters add functional elegance. The hanging hook and chains make it easy to add it to any sturdy wall bracket, window sill, railing, balcony, fence, and more. For a dramatic garden effect, display several baskets at different heights for visual interest. The possibilities are endless. Enjoy a weatherproof design with sturdy construction. Beautiful metal frame in black contrasts your plants and blooms with coconut husk fiber liner. Each basket includes 3 chains with secure S-hook for hanging. Easy to dissemble. Rust-proof. Weatherproof for all seasons. Measures approximately 14" D X 23" H (7" deep).